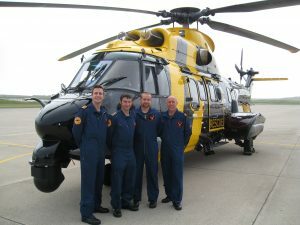 A helicopter crew from Bond Offshore helicopters in Aberdeen, has been recognised for an outstanding air sea rescue. Winchman Andy Cowx also received an Individual Commendation at the ceremony for his courage and bravery during the rescue. On 15th December 2012, Super Puma ‘Rescue Bond 1’ was scrambled to assist the 43 metre long, 516 ton standby safety vessel Vos Sailor, with a crew of 12. The ship had been struck and damaged by a large wave 122 miles east north east of Aberdeen -two miles north of the Balmoral oil platform. The ship had lost all power and one fatality was reported with the bridge superstructure having been badly deformed. All communications had been lost apart from a handheld radio.RB 1 arrived on scene at 0640, two hours before sunrise. Vos Sailor was lying across the sea, dead in the water and without power. High seas with winds gusting to 73 knots were causing the vessel to move violently and erratically. Despite pitch darkness, no visible horizon and considerable heave, winchman Andy Cowx was successfully lowered to the vessel, but he landed heavily on the deck as it pitched and sustained significant damage to his foot. Undeterred by his injury he took charge of the shocked and frightened survivors and co-ordinated their rescue. The ship’s motion was such that the only way Andy could keep himself in place while assisting the survivors was to secure himself between some oil drums by wedging one leg through the strapping which attached them to the ship. As a relatively inexperienced winchman, Andy Cowx was assisted throughout by Paul Walters using the radio connection available to the crew. Maintaining their team effort in this way, the pair brought 8 survivors to the aircraft while Graham Stein endeavoured to provide a stable winching platform in demanding conditions. Nick Smalley, in the co-pilot’s seat, was able to provide advance warning of particularly heavy waves to the rest of his crew as they concentrated on the situation below them. While preparing to recover the ninth survivor, a particularly large wave caused the winch cable to break. The decision was taken for another helicopter ‘CG Rescue 102’ to complete the operation while RB1 took eight survivors to Aberdeen. 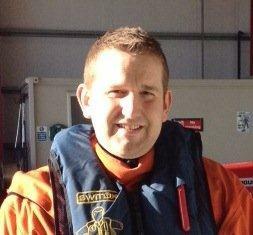 Andy stayed behind, remaining calm working with an unfamiliar aircraft and crew to rescue the remaining survivors. His courage and bravery resulted in saving 11 lives. ‘Rescue Bond 1’ (RB 1), a Super Puma, operated by Bond Offshore Helicopters was tasked to go to the assistance of Vos Sailor with a crew of 12 which was without power. The wind was easterly at 58 kts, gusting 73 kts, with 8-10 metre seas which were causing the vessel to move erratically, with its heading varying between NE and SE. On scene it was dark with no visible horizon yet despite the severely pitching deck Aircrewman Andy Cowx was successfully lowered to the vessel but he landed heavily on the deck sustaining significant damage to his foot. Undeterred he took charge of the shocked and frightened survivors who were in a very exposed location high up and near the stern, and thus particularly susceptible to the movement caused by the high sea state and winds. The ship’s motion was such that the only way Andy could keep himself in place while assisting the survivors was to secure himself between some oil drums by wedging one leg through the strapping which attached them to the ship. While preparing for the recovery of the ninth survivor, the winch wire parted and another helicopter, CG Rescue 102, was tasked to complete the rescue. Andy remained on deck as the sole winchman, working now with an unfamiliar crew and aircraft type to complete the rescue of the remaining 3 survivors. In spite of the appalling conditions, the pain of his injured foot and the prolonged exposure of over an hour on the deck, Aircrewman Cowx displayed outstanding courage, composure and selflessness in effecting the rescue of all 11 survivors from the stricken vessel without further injury. 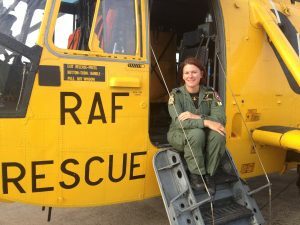 Sergeant Rachael Robinson from RAF Chivenor was awarded an individual commendation for bravery at the Skill and Gallantry Awards. On 21 March 2013, Rescue 169 from A Flight 22 Squadron RAF was scrambled to undertake a medical evacuation. A fisherman had been seriously injured on board the French vessel, Alf, 50 nautical miles from Milford Haven. The crew faced the challenges of a force eight south-easterly gale with a five to six metre swell. During the numerous attempts to place winchman Rachael Robinson on deck, ‘Alf’ was moving so violently and rapidly, with the bows rising and falling some 30-40 ft, that she was frequently battered against the boat. Each time she made contact with the deck she was dragged off due to the severity of the boat’s movement. Successfully on deck at last after nine attempts, she quickly attended the casualty and then elected for a single strop recovery. This placed extra strain and risk on her as she was trying to keep the casualty safe while battling the waves that were crashing over the deck. Helmsman Barry Gourlay from RNLI Anstruther, Fife, was presented with the Lady Swaythling Trophy for an outstanding feat of seamanship during a sea rescue at a national awards ceremony. On 1 August 2012, Forth Maritime Rescue Co-ordination Centre received a Mayday call from MV Princess, a converted 52 ft former lifeboat which had run into difficulty on rocks 200m from Sauchope Beach near Crail. Anstruther Relief Inshore Lifeboat, Norma and Bill Burleigh (D-720R) launched with Helmsman Gourlay in command and crew members Rebecca Jewell and Euan Hoggan. A 25 knot south easterly wind combined with a high spring tide was causing a 2.5 metre swell. In pitch black and with two hours until high tide, the crew made their way to the casualty. As the boat approached Crail, the shelving seabed caused the swell to shorten and steepen to 3.5 metres. With background lights, a beach bonfire and the swell making it difficult to see the shore line, the coastguard deployed parachute flares to help guide the rescue boat. Despite seas breaking over the casualty, which was being pounded on the rocks, Helmsman Gourlay assessed the situation, briefed his team and skilfully brought his lifeboat alongside the MV Princess’ bows and the two casualties were recovered on-board. 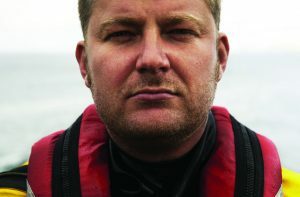 Chief Executive of the Shipwrecked Mariners’ Society, Commodore Malcolm Williams said: “Every year I am amazed by the bravery shown by men and women across the UK who risk their lives to save others. The MV Princess’ crewmembers would not have survived had they attempted to swim to shore. Helmsman Damien Bolton from RNLI Port Isaac, Cornwall, was presented with the Emile Robin Award for the outstanding leadership, skill and judgment he displayed during a dramatic sea rescue. On the 8 April 2012, RNLB Copeland Bell (D-707) was launched to assist two anglers who had been swept into the water at Tregardock, three nautical miles north east by east from Port Isaac. 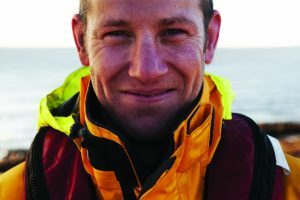 Damien Bolton and his crew – Nicola Bradbury and Matt Main – used their local knowledge and training to get to within three metres of the cliff face despite the confused and dangerous sea conditions. Unperturbed by the proximity of submerged rocks, the risk from a rope in the water and the danger of being broached when the engine briefly cut out they managed to get the two men on-board, one of whom was then transferred to an RAF SAR helicopter and taken to hospital. The outstanding leadership, skill and judgement shown by Helmsman Bolton and the crew’s superb team work undoubtedly saved a life. Mrs Christine Simpson was presented with the Lord Lewin Award for her dedicated work and 25-year service on behalf of the Shipwrecked Mariners’ Society. It is presented to charity volunteers who have given exceptional service. 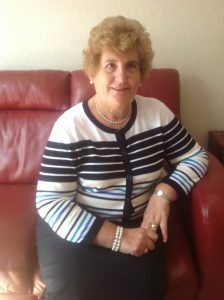 Christine Simpson has worked as an office and welfare administrator for the Royal National Mission to Deep Sea Fisherman at Fraserburgh for 25 years and thereby supporting the work of the Shipwrecked Mariners’ Society by dealing with several hundred cases on their behalf. She has been the essential support to successive Superintendents of the Mission who have been the Society’s Honorary Agents, conducting visits to beneficiaries and completing the associated paperwork. Today there are 60 regular beneficiaries in Fraserburgh and several new applicants for assistance come forward every year. Highly regarded and respected throughout the area she is well known and very active within her local community.